A tax deductible donation will contribute to vital cancer research, support services for patients and their families, and prevention and early detection campaigns. An automated payroll deduction can be set up so it’s easier to give directly to Cancer Council Queensland – it’s a simple and tax-deductible way to donate. Organisations also have the opportunity to match workplace giving. Whether it’s Daffodil Day, Australia’s Biggest Morning Tea, Relay For Life or Pink Ribbon Fundraising, get excited and get involved with your colleagues and friends and raise funds for vital research, support services and prevention and early detection campaigns. Our volunteers are everyday people who generously give their time, skills and energy to our cause. There are so many ways to volunteer you may have specialist skills, be able to provide cancer-related information, support services and education programs for patients and carers or perhaps you’d like to help with administration. Corporate volunteer opportunities are also available, along with volunteer positions at our fundraising events. 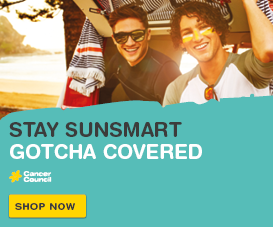 A full range of sun protection merchandise is available through our retail stores located in Brisbane, Toowoomba and the Sunshine Coast, as well as the Cancer Council Shop online. Buying sun protection products from Cancer Council Queensland will not only protect your health and safety, but also support the vital work we do for the Queensland community, and invest in a cancer free future. Would you like a healthier, more productive workplace? Then register for QUEST, a free online tool where you can access resources, templates, posters, tips, hints and educational materials. One third of all cancers cases can be prevented through healthy lifestyle choices, so encourage your workplace to reduce their cancer risk and register for free. We have an active and vibrant online community so like us on Facebook, Twitter, LinkedIn or YouTube to spread the word! Ask a question, share your story, see what we’re up to and the difference we are making for Queenslanders affected by cancer. 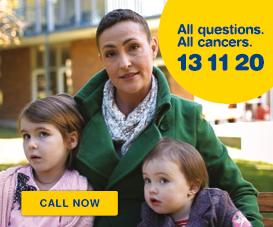 For cancer information and support call Cancer Council 13 11 20 to speak with a member of our Cancer Information and Support team about anything to do with cancer. We provide emotional and practical support, information and referral to Cancer Council Queensland and other community services. Making a bequest to Cancer Council Queensland will help us continue our vital lifesaving work into the future. Bequests are essential in making the long-term commitment necessary to fund research, education and support services for cancer patients and their families in Queensland. Leave Cancer Council Queensland a gift in your will and become one of our Lifetime Partners. 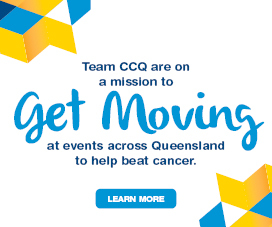 If you’d like to be more involved with Cancer Council Queensland, we welcome the opportunity. A partnership whether financial or in-kind (pro-bono) can be arranged. Please contact our Corporate Partnerships team to discuss ways we can work together for a cancer free future. Have you or someone you love been touched by cancer? Help us give hope to Queenslanders affected by cancer by sharing your story. Stories like yours provide comfort and support to others whose lives have been touched by cancer. We would love to hear from you.